Important! :All of the ETS series Nervo-Scopes are protected by a full two-year warranty against workmanship and defective components. In today's world, cell phones, tablets, laptops, Blue Tooth systems, wireless networks, radio transmitters, fluorescent lights, etc. are everywhere. In essence, RFI is at an all time high. As a result of feedback from the Chiropractic community, EDL's newest Nervo-Scopes® (ETS-9 and ETS-9A) are engineered to reject the influence of these sources and give stable, accurate readings every time the instrument is used. EDL's newest Nervo-Scopes® have the same sensitivity as our previous models. The ETS-9A is compatible with the Analagraph® Graph Recorder and both models are designed to automatically power down after ten minutes. 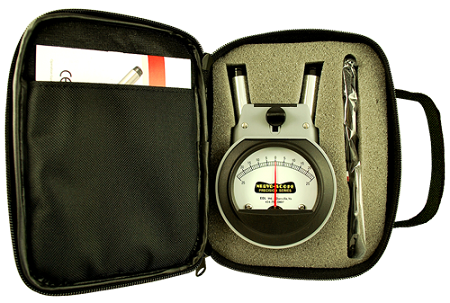 The Nervo-Scope® ETS-9 is not compatible with the Analagraph® Recorder. Adjustable Detector Width - Capable of adjusting from 0.6" wide to 2.1" wide. Auto-Power On/Off - One easy-touch button powers the instrument. After ten minutes of non-use, the unit will automatically power off. Question: I went to use my Scope, but the pointer did not move? Answer: Make sure you push the ON switch every time you pick up the instrument for a glide. Check the battery. Verify that the shorting switch is not in the short position. Question: When I make a glide, the two legs move? Answer: Check to be sure you tightened the thumbscrew, make sure there is a washer under the thumbscrew and that the serrated side is towards the housing. Question: When I turn ON my Nervo-Scope®, the pointer does not rest on Zero. 1. Push the shorting switch to the short position, turn the Nervo-Scope® ON and place it into the EDL box, close the lid and the pointer should rest on Zero ñ one division. 2. Remove the Nervo-Scope® and push the shorting switch into the non-shortening position, place it back into the box, close the lid, let it sit for fifteen minutes or longer. 3. Open the lid, turn the Nervo-Scope® ON, and place it back in the box, close the lid. 4. Wait one minute and the Nervo-Scope® pointer should rest on Zero ñ two divisions. 5. When handling the Nervo-Scope®, do not touch or blow on either detector. Only have the Nervo-Scope® out of the box long enough to move the switch or turn it ON. Question: Where do I send my Nervo-Scope® for repair, recalibration, or refurbishing? * Please remember to well pack your instrument, with at least three inches of resilient packing on all sides, including the top and bottom. Include your name, address, email address, phone number, and any special needs or requirements that you may have. All work will be quoted before we proceed with the repair. Question: My instrument might have been dropped, what do I do? Answer: Visually inspect your Nervo-Scope®. Make sure the pointer is on Zero; look at the detectors, and see that the small wires are all uniform and parallel. Verify that the glide caps are still in place on the ends of the detectors. Check that all of the switches move properly and appear to work. At this point, try the instrument and see if it works the way you are used to, if it does work as usual than everything is fine! If not, please send it in for repair. Question: Some of the wires on the detector look greenish, it this mold? Answer: Not normally, although it is possible for mold to grow. It is usually ?green rot,? a form of corrosion. Proper cleaning will keep the detectors working and looking good. Question: I finished using my Nervo-Scope®, but it will not turn OFF. Answer: All of the electronic Nervo-Scopes® have an automatic power off feature. They turn themselves OFF after approximately fifteen to thirty minutes from the last push of the ON button. Pushing the ON button merely resets the built in timer and keeps the instrument ON, it is not a toggle switch. Question: When I pick up my Nervo-Scope® to make a glide, the pointer seems to shift position as I move it. Answer: Make sure that the instrument is OFF and place it flat on its back, verify that the pointer is resting on Zero, now turn the instrument so the detectors are parallel with the floor and see if the pointer is still on zero. Verify that the instrument is still off, the pointer should return to Zero ñ two divisions through all of these positions; if it moves off zero it means the balance of the meter is off and it must be returned for repair. We hope this information helps you use your Nervo-Scope® with more ease and confidence. EDL is here to assist in every way possible; if additional information is needed, please call 1.800.342.5335 or 434.799.0807, email: sales@edl-inc.com, or visit our website: www.edl-inc.com.